Other sailors have told me – from their cozy position on a powerboat, or from a spot firmly on solid ground – that one day it just changed. Nothing dramatic or bad happened; they were just done. It seemed incomprehensible to me, at the time, in each conversation. There is another Auklet post, written but not yet put up, from the beginning of this summer. It has to do with considering the possibility of being done, and various reasons for this dramatic shift, but was written while there was still sailing to do this year. I had committed to the Junk Rig Gathering in Penobscot Bay, for one thing. As the organizer of the event, it would not have done, to miss that. Certainly not for a reason as diaphanous as this odd feeling in the back of my mind. It’s good that I went on that trip, which turned into 37 days, up and down Penobscot Bay, as well as the going and coming back to Gouldsboro. Penobscot Bay is a solid 50 miles from here, or more, depending on route, and how one counts arrival and departure. It was a good trip, better than the previous two, earlier in the summer, this one with lovely wind and quite a bit of fine weather. The Junk Rig Gathering was stellar, and visits with friends and family from Rockport to Swans Island all added to the enjoyment. Oddly enough, when I got home I still had that feeling, more and more entrenched, that it’s done. A profound relaxation even, as the boat came out of the water, rather than my usual immediate pining for spring. This was good to discover. It wasn’t because of a bad trip, sloshing around with no wind and not enough sleep, or fog and no wind, or bashing grindingly to weather, into too many gusts and too many waves, or any of that. During that last trip there was beautiful, stupendous sailing, along with the typical interjection of less-than-stupendous harbor issues, those last completely balanced by nights, and days, in gorgeous, idyllic, peaceful coves. There was more to learn – always, which is one of the things I love about sailing – and a chance to feel the familiarity with the boat that has made it possible to sail well in a variety of situations. Sailing onto and off of docks, and out in the wild wind and foaming waves, there is huge satisfaction in watching the boat, and rig, go, with a certain amount of competence, from all these years. Oddly, and for the first time, this wasn’t enough. The rather cramped space inside the boat – which has never bothered me for longer than the first couple of days after moving aboard – felt constricting, and uncomfortable, ongoing. The long calms were aggravating, rather than meditative. More than all of that, the fear of making a mistake, of ending up on a rock somewhere, or overboard, never really left. I said prayers for actually making it home in one piece, hoping that I might pull that off this one more time, and thinking how ironic it would be to crash just when I was ready to stop. Fortunately, no rocks were so much as tapped, this entire season, and I stayed firmly on the boat, at all the appropriate moments. Neither of these concerns used to cause me nearly so much stress. In the past I have indeed clunked rocks occasionally, not being that worried about it, while at the same time staying attentively away from the big ones with breaking seas. While I was always careful to not fall off the boat, it wasn’t a big concern, other than being mindful of exercising basic caution. The risk did not particularly worry me after the first couple days of adjusting to being aboard. Now, I have lost my nerve. The funny part is that it doesn’t feel like “I have lost my nerve and therefore I am ready to stop sailing.” That might be it, but it feels more like I have become ready to stop sailing, and therefore whatever magic that produced the nerve to do all the wild things I have done afloat has evaporated, along with that underlying, rather driven desire. The desire melted away, and with it the capacity to do those somewhat brave, nervy things. Oddly, I’m not really missing it. This could of course change, and I could go out again. But I don’t really expect that. Sailing has given me so very much: solitude and self-sufficiency, when my life on shore had neither; travel, and marvelous connections with people; friendships and good times remembered, which all remain; a task requiring such depth and breadth of knowledge as to make it completely absorbing, for years. Connection with the gorgeous ocean, and the light, and stars, on the water. Nothing takes that away. Meanwhile, there have been other considerations. This last year has been somewhat daunting, from a memory perspective. I’ve written before about both cognitive and memory issues, that have come and gone, and various interpretations of why that might be. It has become more difficult to remember odd things that pass in a day, or a week. On land it is rarely significant, but it remains shocking to perceive such blank spaces where something was once known, or to completely forget relevant, familiar details, in the face of a current question. On the water, there is a limit to how far one can go, compensating for those kinds of gaps. At some point, extra study, and knowledge, and a rather OCD approach to daily systems, are not enough to tip the balance toward safety. I think that I could still do it, sailing off, but the risks feel palpable, in a way that they didn’t used to. Perhaps this comes back to the question of nerve. Nothing used to stop me, including obstacles that are not these days as big as they once were. But the drive has left. The boat – and sailing overall – have brought me here, blessed to be in a place where the tide rises and falls outside the window. Or at my feet. 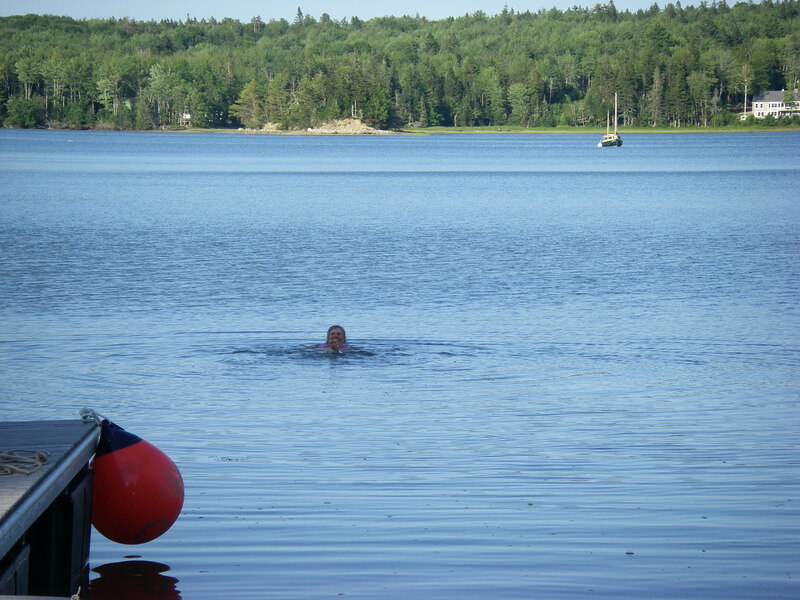 The warm weather will come again, and I hope to be swimming. There is more to say, about this and that – a little bit of trip stories, the Junk Rig Gathering, and the article about the Mer Veille radar detector that I’ve been meaning to do for ages. Posting that other entry from a few months ago, about contemplating stopping, is on the list. I’ll hope to be filling these in, over the next while. Thank you so much to all the many readers here, and especially to those of you who have written back. It’s been such a pleasure. I am in my late 50’s have sailed far less and made far shorter trips than you, but have been feeling the same way. Just no longer driven. (Though I might not be QUITE done: one of my first thoughts on reading your post was, “what will happen to that lovely boat?”) You have LIVED on the water. You have a lot of experiences under your belt to recall and reflect upon for years to come, and achievements of which you can be justly proud. Glad to hear you’re not quite done, even if less driven! You’ve done some tremendous things yourself, and what a great boat you have for quiet coves, even if you might not set out again across Cape Cod Bay :-) . As for AUKLET, it’s a question that’s sitting, with no immediate plans. The boat is snug in the boatshed, and we jacked the trailer/boat up and put it on blocks a few days ago, so there’s no rush. I might wait until next summer, just to make sure that I don’t have a change of heart, to start thinking about a possible new home for it. It would be fun to see somebody come along who might want to use it for the sorts of things for which it’s been outfitted… That narrows the pool! Wishing you a great winter – I’ve so enjoyed all of our conversations here. fair winds and following seas to you! you are an inspiration to me and surely many others. carry on with your writing and living large and i hope to hear more from you! peace. margot and i (and joshua slocum) try to sail Frolic with the grace and insight you tender in your blog and , indeed, even more so in person. we value knowing you and hope to remain in touch be it personally or through media. thank you for all. Thank you so much for all the kind words. It’s been a treat to stay in touch here, and I very much hope that we get to continue, one way or another. 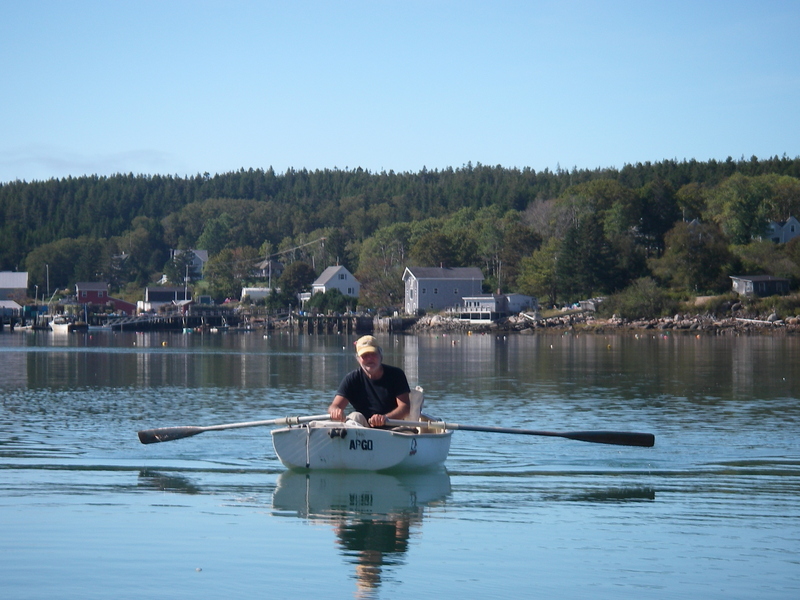 Do you think you might sail downeast with FROLIC? It would be so special to see all of you here! Please do keep that in mind if you venture this way, by land or sea. In the meantime, here’s to keeping up via electronics! Wishing the two of you – and Joshua – a tremendous winter. I left a nice comment, but something went wrong and I guess you can’t read it! Darn! Oh too bad! I’m sorry to miss that. But happy to remember all the lovely things you’ve said to me directly, about all this adventuring. And I am most glad for all the special visits that we’ve had, as a result of this time on the water. “Believe me, my young friend, there is nothing – absolutely nothing – half so much worth doing as simply messing about in boats.”. .
I’m hoping you will not put an oar over your shoulder and travel far from the sea like whats-his-name…. So far, no worries about that oar thing :-) Though it does appear that I may have confused an anchor for lunch… I like your corollary, Whalen. Thank you for your thoughtful writing. This piece, which I’ve just read a second time – savoring your descriptions, is especially meaningful. Thanks for sharing it with us, your friends in distant places. I recall an unexpected shift (in August 2004) in my thinking about my professional career, which I’d loved and assumed would continue for at least another decade. I was amazed at how quickly and calmly I changed direction. It was time to let the job go. Memory lapses (increasing difficulty recalling names of students) was one factor. As you know, I’ve been active and happy in retirement, with no regrets about ending the career that had once been a huge part of my identity. New adventures, such as sailing with you in the PeepHen, came along. I wish you well, and hope our paths will cross again before too long. That’s a nice way to think about this transition, as something a bit like retirement. You are an outstanding role model, for how to move on to the next phase! What beautiful writing, Shemaya. I hope this means that the special — magical? — feeling of being on the ocean can now be found at home, or in some sense satisfied in a different, land-bound, way. Home is indeed quite nice – magical, even. I’m rather taken with the forest, lately. And the gorgeous water right next to it, with little wavelet sounds on the rocks. It is, indeed, its own kind of special, and I’m happy to be here. Thank you so much for your sweet thoughts. I’ve been meaning to write you for some time — I have an “ocean” question, which I am sure you can answer! Once again, long (2-hour) walks at the beach have become a regular highlight of my life. Here on the west coast, the continental plate drops off right off the coast. So, unlike when I was there and walked the beaches of NH and southern Maine, the walking needs to happen around low tide. I consult the local tide chart to plan my week. Along with the time of the low tide, there’s a listing given in feet. What does this refer to? Sometimes there’s only 1 foot of difference between low tide and high tide — I’ve learned that means I need to be walking at exactly low tide, that very little of the damp firm sand I like to walk on will be exposed, and that I’ll be walking on the slant of the beach. Other times, like at the full moon, the number is low or even in the negative. That means the water will be way out with lots of flat firm sand exposed, and I have much more flexibility for timing my walk. What is being measured in this notation of feet? What does it mean to have negative numbers? I hope you are settled in for a long winter’s nap by a cozy fire. I hope to keep walking through the winter, even though dark and cold come early. I’m still writing but have set aside the memoir for awhile to work on a novel, which seems to be a way of working through some remaining CSA issues. But I am well, have lost more than 50 pounds in the past year. Recently I did some sewing, the first since last January when I started writing. Oh, how I’ve missed it! I made some flute bags for Emiliano, and now some of his flute-maker friends are wanting flute bags, too, so I may be able to create a little bit of income that way. I’ve enjoyed your posts; you write so beautifully — will you continue to write in some form? I hope your dry-dock time will bring you some of the peace and pleasure you found in sailing. How wonderful about the long walks on the beach. And that you have a tidetable for planning them. The heights of tide in the table are generally based on “mean lower low water.” This is a reference point chosen, somewhat arbitrarily, by the folks who make nautical charts and tide references. Have you noticed that, in any given 24 hour period, one of the tides is higher than the other, and one of the lows is lower than the other? It’s generally true, sometimes dramatically. So working from the “lower lows,” they take an average, and that is “mean lower low water.” All of the heights of tide and the minus tides (as well as water depths marked on nautical charts) are referenced to that measurement. Somewhere around Santa Barbara there might even be a stick at the shore, maybe attached to a pier piling, marked off like a vertical ruler and showing these measurements. You could even figure this for your favorite beach, if you go there for low tide on a day that shows a “0” for the height of tide for that low. Storms and/or wind can make reality different from the prediction, but if the weather is basically mild, it should be about right. It might be fun, just for kicks, to have your own scale from known rocks or something. Then the thing to remember is that if for example it’s a -1 low tide, that’s a vertical measurement, down from the water level for “0.” The various marks should be pretty consistent from one time to the next on your beach-marker tide indicator. I hope that helps! Here, things are indeed cozy – though I hesitate to use the word “fire” while things in southern California have so much going on. I’m hoping that your part of Santa Barbara is in fact not being evacuated, and am sending many good thoughts. We’ll see what happens, as far as writing – who knows what might present itself… Thank you so much for the sweet feedback. I’ll send a separate e-mail to catch up a little more! What a beautiful essay! Thanks for putting your thinking into words for all of us to share. I’ll miss all the travel and technique stories, but it is good to know that you’ll be enjoying Joy Bay as a swimmer. Is this, perhaps, a farewell to cruising, that might leave room for sailing a dinghy around Lobster Island every once in a while? Who knows – quite a few stories, and a few technical odds and ends, still haven’t made it from the inside of my head to the blog. The boat tidbits might not be over yet! As for the bay, one never knows. Shantyboats remain in mind. As does the hope of seeing you sail up to the float here. I’ll be looking forward to summer! Shemaya, I can understand how you feel about staying ashore for a bit, and letting memories and thoughts of your sailing linger now and fulfill your being. As one who has spent some serious time on the ocean, not quite in the same way, I can still understand the reflection and urge to stay on solid ground. I also have seen quite a few individuals make decisions, time passes, and the longing and urge returns. I would recommend strongly that you let Auklet rest a bit, as it has a nice snug alcove to do so. She is a special vessel, one that so well meets your needs and best compromises, and she is ready and waiting should you be inspired to venture again. If some time passes and things stay grounded ashore, then you can decide the future. I think it best to let things stay “hoved to”, and look ahead a bit for the forecast. In the interim, life close to home can be a good. The Pudgy can get you around and explore close by. We can also make some accommodations for some short cruises on some of our other vessels here on the bay. When the magic comes upon us, we are enchanted; when it leaves us, how like emerging from under a spell, or a geas put upon us! As if awakening from a hundred years’ sleep with the memory of dreams beyond our waking life. please don’t stop writing of things and your life.